Sending your luggage is a much easier way to get your things from A to B. It saves you having to drag everything behind you, and on and off conveyor belts and public transport. Plus, it allows you to have many more of your belongings at your destination than you could check onto a Southwest flight. Get your free quote now. One cabin bag; 10 x 16 x 24 in (25.4 x 40.64 x 60.96 cm), plus one personal item; 18.5 x 8.5 x 13.5 in (46 x 21 x 34 cm). There is no specified weight restriction for carry-on items. A number of personal items can be brought on board, in addition to the standard carry-on allowance. These are: umbrellas/ walking canes, outer garments, food for consumption during the flight in disposable packaging, assistive/ mobility devices, and a child restraint for a ticketed child or when a complimentary, available space exists. Musical instruments can be brought on board if they fit under the seat in front or within the overhead locker. Larger instruments can be brought on board if you purchase a seat for them. Such instruments must fit within a seat (only one per seat), be secured with a seatbelt, and must not block any aircraft signage. Southwest allows small domesticated cats or dogs to be carried into the cabin, provided they are transported in a suitable carrier that measures no more than 8.5 inches high x 18.5 inches long x 13.5 inches wide (21.59 x 46.99 x 34.29 cm). A fee of $95, one way, is levied for each pet carrier. One pet carrier counts as one of the permitted carry-on items. Pets cannot be checked into the hold with Southwest. 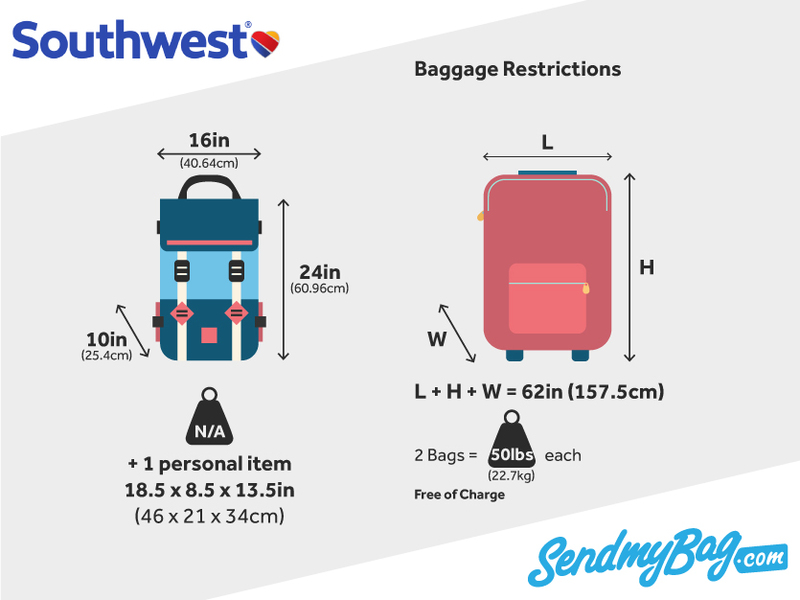 Two items of luggage, free of charge, with each weighing no more than 50 lbs (22.7 kg) and measuring no more than 62 inches (157.5 cm) in total dimensions. If you wish to check a third bag you must pay a charge of $75. Passengers travelling with children may also check one pushchair and car seat, free of charge. Overweight items weighing between 51 and 100 lbs (23 and 45 kg), and oversized items measuring over 62 inches, but not more than 80 inches (203 cm), are charged at $75 per item. Military personnel on active duty or permanent change of station orders are exempt from the two-piece baggage limit and will not be subject to excess, oversize, or overweight baggage charges, providing no piece exceeds 100 lbs in weight or 80 inches in total dimensions. Most exceptional items, such as sports equipment and musical instruments, may be checked in to the hold as one free item of hold luggage. However, some larger items will incur a charge of $75, one way. These include bicycles larger than 62 inches in total dimensions, as well as surfboards. Looking for Southwest sized hand luggage?